From the series “Eight Views of Ōmi”. The “Eight Views of Ōmi” are among the most popular subjects in Japanese art, and were also prevalent in ukiyo-e over a long period of time (cf. cat.52). This is a print from the first series by Hiroshige (he created a total of 20), which is complete in the Riese Collection. It provides an indication of the high artistic quality of those that follow. It is a view of a majestic winter landscape in shades ranging from white through various tones of grey to black. The many printing variations to which this set of blocks was subjects was first pointed out and studied by James Michener in The Floating World, where he compared ten areas on five different impressions in American and Japanese collections. His results were inconclusive, but showed that even among fine impressions the entire colour scheme could vary, and that on late impressions there were even greater differences. Two things can be achieved by comparing different impressions of the same print. The viewer can deepen his appreciation of the picture as a whole by observing differences, and noting his or her preferences. And by a careful study of certain critical features, like the deteriorations of finely carved lines, and the clogging of areas engraved in reserve, it is possible to establish a chronological series among impressions, and form an opinion of which was the earliest, and how they followed one another in sequence. 1. The hilltops in the foreground a middle distance are printed dark at the top, becoming lighter at the bottom. 2. The large form of Mt. Hira is entirely white, with no overprinting. 1. The hills are dark at the bottom, light at the top. 2. A grey cloud on the left horizon obscures the lower part of the mountain. 3. There is noticeable wear along the outline of the leftmost high peak. 4. Impressions in this state are conspicuous for the rows of white dots in the dark grey block in the very centre of the print, which Michener describes as trees, or glacier marks. These were engraved on the blocks used in the first state, but only appear as lightly embossed. The effect of this reversal of colours is to diminish the contrast between the dark hilltops in the foreground and the majestic white expanse of Mt. Hira, and the print loses a great deal of its drama. 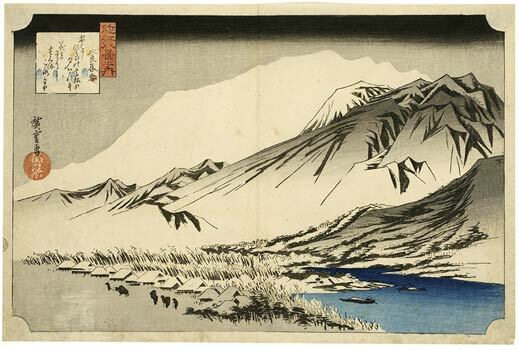 Well-printed impressions of this state are relatively common and it is by these impressions that the print is usually known (Ledoux, Hokusai to Hiroshige, no. 26; Ukiyoe Taikei, Vol. 11, no. 27 (the Sakai impression, reproduced in colour). Later impressions of this second state, with an extensive use of green in the foreground at the left and on the lake side are reproduced in colour in Strange, The Colour Prints of Hiroshige, p. 172, and in the Scheiwe catalogue, no. 467. In these impressions there is more wear on the key block (although on the Scheiwe impression the broken lines have been penned-in), and the sky is coarsely printed with the vertical lines of the brush used for applying the colour showing distinctly. Michener describes another impression in the Boston Museum with extremely poor printing, and coarse colours, with the remarkable addition of snowflakes in the lake.